Hamster-Powered Monster Will Fascinate The Kids Young And Old Alike | OhGizmo! This is a Stranbeest powered by a hamster in a wheel. A straandbeest is a multi-legged contraption created by Dutch artist Theo Jansen. Normally on display on Holland’s beaches, it’s now transformed into a tabletop contraption that uses a hamster ball with the hamster inside as the locomotive power; the ball turns some gears, which in turn propel the mechanism forward. Its eerie gait is sure to fascinate your kids at the very least, and even you if you still have an impressionable spirit in your curmudgeonly old age. 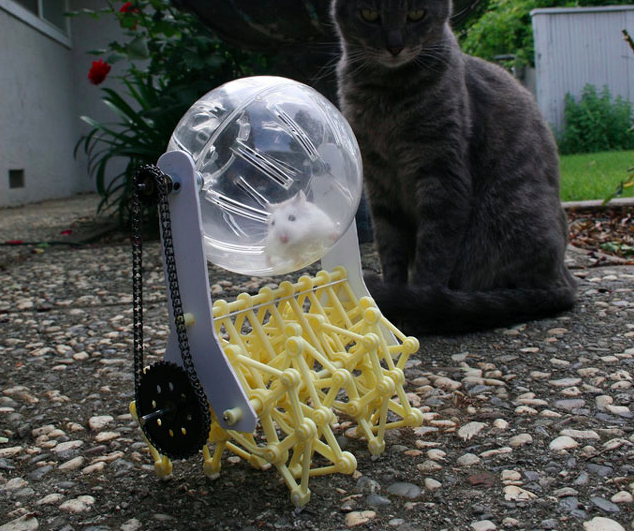 For $35 you can get an assemble-at-home kit, although the hamster is not included.